SAN LUIS OBISPO, Calif. — (January 8, 2015) — The San Luis Obispo Marathon, Half Marathon + 5K presented by LeftLaneSports.com has announced a partnership with McMillan Running LLC for its 4th edition on April 24–26, 2015. McMillan Running, based in Encinitas, Calif., will be the event’s Official Training Program and Training Product. For entrants, the partnership includes Official SLO Marathon + Half Marathon Training Programs by McMillan Running for $49.95, available at http://www.slomarathon.com/category/training. McMillan Running will also power the SLO Marathon’s Ambassador program by training 10 ambassadors through to the finish line. 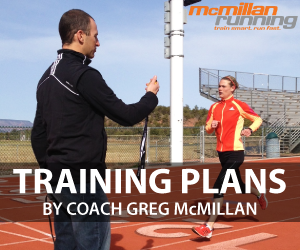 McMillan Running LLC was founded by Greg McMillan as a comprehensive online resource for distance runners. The company’s website and its companion, McRun App, provide a wealth of information for runners as well as training plans, personal coaching and other products and services. McMillan Running’s mission is simple: to help people fulfill their running potential, and to-date, hundreds of runners have received comprehensive training advice with proven results and success. Visit mcmillanrunning.com for more information. “The SLO Marathon is a hidden gem on the annual event calendar, and we’re thrilled to be partnering with the organizers to support participants and the wonderful event Ambassadors on their journey to complete the Marathon or Half Marathon,” commented Greg McMillan.